… and nose to the wind, little one. Prayer flags whip in the crisp air, the lofty peaks of the Himalayas gleam in the distance … and the ancestral home beckons. Godspeed, Lanni. I got word this week that we lost one of our fosters. A 14-year old, she recently developed canine cognitive dysfuction (CCD) and was clearly unhappy and uncomfortable in her surroundings. Never easy to let them go even when we know we are doing the right thing by taking their pain and making it our own. A milestone for us as this is the first placement (that we’re aware of) that’s aged out. 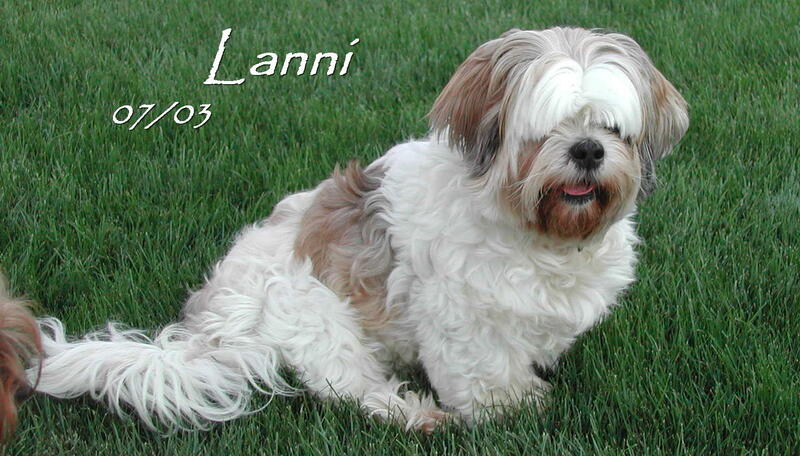 Lanni arrived in rescue as a shaggy 7-year old. Her elderly owner had passed away and the family was unable to keep her. I recall how badly infected her ears were. During the intake exam, I flipped her ear leathers over and was appalled at what I found … ears full of black, gunky debris. Literally full. I started cleaning them out, getting black chunks as large as my thumbnail. A review of the medical records provided noted she had an allergy to corn. The food and treats dropped off with the dog all contained … corn. No telling how long her ears had been chronically infected. A larger Apso, it was a wrestling match every time we dosed her ears with the Panalog. Applying topical medication is normally not a problem for me; however, I couldn’t do it myself and had to enlist hubby’s assistance in restraining her. Very much like holding a greased pig. Lanni had not been socialized around other dogs and was a bit, ummm how shall I say … lacking in canine manners. My crew did not appreciate her shouldering her way through any situation like a bull in a china closet. Gentle as they come, just not able to read the other dogs’ body language. After a short time in rescue, Lanni hit the jackpot and went to live with Elaine and her mom, Anne, where she was well cared for and deeply loved. I know the days ahead will be a bit less bright without gentle Lanni to grace their home. My thanks to Elaine and Anne for taking such good care of her all these years. Aw, she is so cute! RIP Lanni. So glad to see a rescue that was able to enjoy a full life. May her family find joy, in their memories with her. I love the saying that began the post. Is it from a poem? Head high … … and nose to the wind, little one. Prayer flags whip in the crisp air, the lofty peaks of the Himalayas gleam in the distance … and the ancestral home beckons. >>> I love the saying that began the post. Is it from a poem? The above is something I penned many years ago to honor the passing of those near and dear to our hearts, with tribute to the breed’s ancient Tibetan ancestry.